When the catalogue for the April 2010 sale of antiquities at Bonhams appeared my eye was drawn to a Roman marble statue (lot 137). I was particularly struck by the fact the piece had surfaced on the market via Sotheby's in London in December 1986. The sale was one that contained a number of pieces directly linked to Giacomo Medici. Within an hour a colleague had responded to my hunch and sent me an image of the statue that had featured in the Medici dossier seized in the Geneva Freeport. Bonhams can hardly have been unaware of the significance of the toxicity of antiquities that had surfaced at this particular sale. It should be remembered that two of the lots that were withdrawn from what can only be described as a disastrous sale of the Geddes collection had also come to light in exactly the same way. 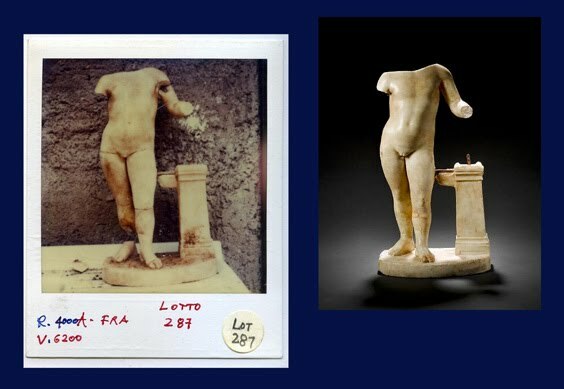 It remains a puzzle why the antiquities staff at Bonhams were not suspicious of this particular collecting history (or "provenance"). What measures did they take to check that the piece had not passed through the hands of Medici? Or had they hoped that nobody would notice? This raises a major issue for the management of Bonhams. Did they fail to learn any lessons from October 2008? Were they deaf to Lord Renfrew's comments in the House of Lords? Or is there a perfectly innocent reason why an annotated image of the Roman statue should be in the Medici dossier? Composite of Polaroid seized from the Geneva Freeport and a statue due to be auctioned at Bonhams in April 2010, "Acquired at Sotheby's London, 8th-9th December 1986, lot 287".